Today, GPS trackers can come in handy for a lot of different things. If you're going on a road trip, chances are you've got a GPS device in your car to help you get where you're going. Have you ever thought about attaching one of these units to your dog? This Tractive GPS Pet Tracker make it easy to know exactly where your dog is at all times. I used to think GPS for dogs would only be beneficial for hunting canines or dogs that aren't trained to stay in the yard. We train our dogs not to leave our property and we keep a close eye on them while they're playing outside. 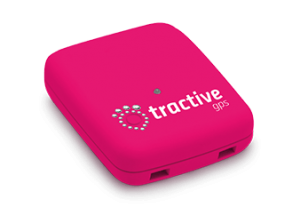 I didn't think a GPS tracker would be beneficial for our family at all, but this GPS tracker from Tractive changed my mind. I never realized how much I worried about our dogs in the past. It was always in the back of my mind when they were outside. I would check on them every few minutes, but when you're in the middle of doing something that can be a pain. I guess I've gotten used to being interrupted every 5 minutes to check on dogs for so long that I don't even realize it anymore. Enter Tractive. I was sent their product in exchange for my honest Tractive GPS pet tracker review. So far, I can say that it's actuallty wonderful! The peace of mind that it provides me with is so reassuring and I can monitor our dogs right from my smartphone. I set up a Safety Zone around our home, and now I'm notified the minute they cross the boundary. Even though our well-trained dogs don't cross that boundary often, I no longer need to stop what I'm doing every 5 minutes to make sure they haven't wandered off. I'll admit, I didn't trust the device completely at first, but once you get used to it, you'll soon find out that GPS trackers for dogs are actually quite useful tools. So the idea of the Tractive GPS Pet Tracker is pretty simple. You attach this small dog GPS device to your dog's collar (you can see exactly how to do that in my video) with one of the 2 provided clips. One clip is for thinner dog collars and the other is for thicker collars (which I use on my Saddie's collar). After attaching the device, you download the Tractive app, which is free for Android, iPhone and Windows phones. You can also access the information via a web browser on your tablet or computer. Tractive's GPS app allows you to see exactly where your dog is in real time every second of the day. You can even create a customized “Safety Zone,” and you'll be notified the instant your dog crosses the invisible boundary. For more information about a Tractive GPS Pet Tracker and the company itself, check out my interview with Michael Hurnaus, CEO of Tractive. Tractive GPS Pet Tracker makes it virtually impossible for my dog to get lost. I always know where he is at every moment. If he happens to wander off, I will still know exactly where he is and I'm able to retrieve him quickly. When you purchase a Tractive GPS Pet Tracker, you get the GPS tracker for dogs, a charger, 2 clips to connect it to your pet's collar and an instruction manual. The first thing you'll notice when you take it out of the box is the charger. It's a bit different than the traditional plug-in chargers that we're used to, as it actually clips onto the device. You can see a picture of it later in this article. Like I said, I was a skeptic before I actually got to give this dog GPS collar and app a try. I thought pet GPS trackers were only effective for working dogs or dogs that had an issue with escaping their yard. I never thought my well-trained dogs would benefit from one. I guess I was right… sort of. It's not my dogs that benefit from the tracker – it's me! I never realized how much time I spent wondering if my girls were still in the yard. I've gotten so used to it after raising generations of dogs that it's just part of my daily routine now. I don't have to worry about them anymore, though. Tractive's GPS app is quick to install and very user friendly. There are buttons that allow you to find your dog, turn on a light on the tracker if you're looking for him in the dark and see where your dog has been over the last 24 hour period. You can even monitor multiple dogs with the GPS app – you'll just need to purchase additional trackers for each pooch. I also liked that my Tractive GPS Pet Tracker has a built-in battery indicator that alerts you when the battery gets low. There are no worries about losing my dog because her tracker isn't working. Tractive GPS Pet Tracker will work in more than 80 different countries, and there are three models to choose from. The traditional model is the white one that I use in this video review. There is also a Special Edition, which is pink and made with Crystals from Swarowski, and a Hunter's Edition, which has a camouflaged design is made of a more durable material. Now, it's that time in the review when we talk about drawbacks of Tractive GPS Pet Tracker. But truthfully, I really don't have anything to complain about when it comes to this dog GPS tracker; it does what it's supposed to do, and it seems to do it well. One thing to mention – and you can see this in my video – is that the 2 clips that come with the GPS tracker are not intended to be used on thick or wide collars. So with that in mind, you may need to buy your pet a standard dog collar if he has a unique collar, like our Chloe. She has a collar made of rope (one of those I linked to), and it's a very thick collar. It's no big deal to switch dog collars, especially considering the benefits you get from Tractive GPS Pet Tracker. Another drawback of this GPS tracker for dogs is the price, but let me just start by saying that for the peace of mind that you get and the instant ability to know exactly where your dog is at any given moment, the price is completely worth it in my opinion. The device itself is regularly $179.99, but it's on sale right now for $129.99. So if you're considering buying your pooch Tractive GPS Pet Tracker, now may be the time to look into it and save $50. The improved Tractive Hunter's Edition is on sale for $149.99 right now that's best for hunting dogs, and you can pick up their unique design Tractive's Special Edition as well but prices vary. I understand that this isn't going to be an affordable device for everyone, but I do strongly recommend considering the purchase, especially if your dogs are regularly outside by themselves. My favorite thing about this product? Its versatility! You can take your dog ANYWHERE with cell coverage, and you'll still be able to monitor his exact location. All you have to do is setup a new Safety Zone for the location you're at and you'll be notified when your Fido wanders too far away. This is a wonderful tool to bring along while traveling, camping or hiking with your dog. Because Tractive GPS Pet Tracker runs on a cellular network, you need to pay a monthly subscription fee – just like you do with your cell phone. The fee for the Basic package is $6.99 per month, but you can save a little by signing up for a 1- or 2-year subscription. There are only 2 clips to attach to your dog's collar. They won't work for thick or wide collars, so you may need to get your pet a traditional collar to secure the device properly. It's expensive, but worth every penny. Along with the steep price, you'll also be required to pay a monthly fee to keep your tracker activated. Do you have a Tractive GPS Pet Tracker device? Have you ever tried one? Whether you were as happy with yours as I am or you have a much different opinion, we'd love to hear it! You can leave a review here so other readers can have your feedback as well. The more informed dog owners are, the better choice they can make about the pet products they choose to buy. Tractive GPS Pet Tracker make it easy to know exactly where your dog is at all times thanks to their real-time GPS monitoring. You can set up a Safety Zone as well, and you'll be notified the minute your dog crosses the boundary. They are a bit expensive, but worth every penny in my opinion.